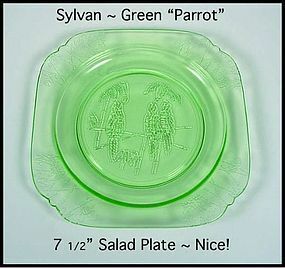 This 7 1/2" Sylvan Parrot salad plate was made by The Federal Glass Co. from 1931-1932. It is in excellent condition! We have 5 plates available for $22.00 each. 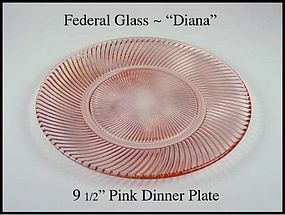 This pink Diana 9 1/2" dinner plate is in excellent condition! 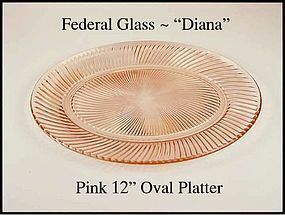 This pink Diana 12 inch oval platter was made by Federal Glass in the 1930's, and is in excellent condition! 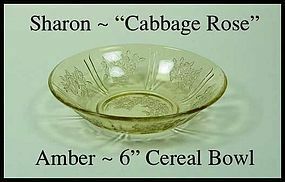 This amber Sharon "Cabbage Rose" 6" cereal bowl is in excellent condition! 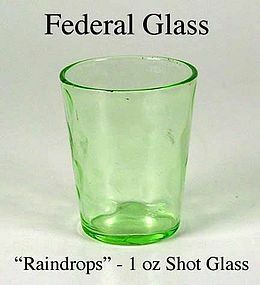 It was made by The Federal Glass Co. in the 1930's. We have 2 of these HTF bowls available for $14.00 each. 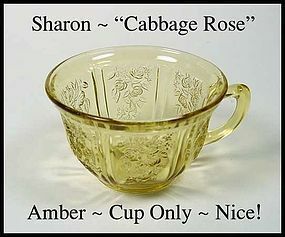 This Sharon "Cabbage Rose" amber coffee cup only was made by The Federal Glass Co. in the 1930's. It is in excellent condition! We have 2 of these cups available for $6.00 each. 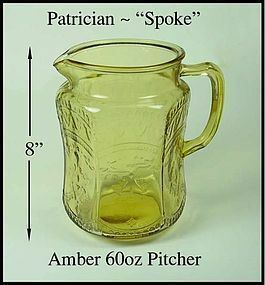 Federal ~ Patrician "Spoke" Amber 75 oz Pitcher 8"
$55.00 - SOLD! Thank You! This amber 75 oz Patrician Spoke 8 inch pitcher is in excellent condition! It was made by Federal Glass in the 1930's. We have 1 of these pitchers available for $55.00. 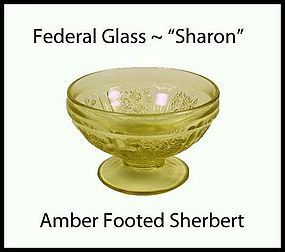 This Sharon Cabbage Rose ftd sherbert was made by the Federal Glass Co. in the 1930's. It is in excellent condition! 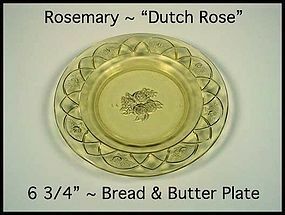 This amber Rosemary Dutch Rose 6 3/4" salad plate was made by The Federal Glass Co. in the 1930's. It is in excellent condition. We have 4 plates available @ $5.00 each. 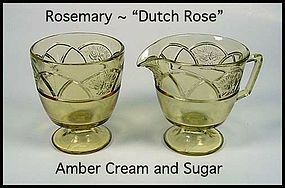 This amber Rosemary Dutch Rose cream and sugar set was made by The Federal Glass Co. in the 1930's. It is in excellent condition. We have 2 sets available @ $12.00 each. 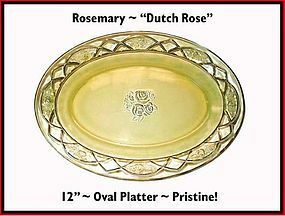 This Rosemary "Dutch Rose" 10" oval platter was made by the Federal Glass Co. in the mid 1930's. Beautiful! 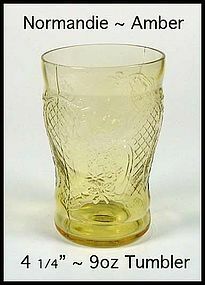 This amber bouquet and Lattice 9 oz tumbler is in excellent condition! It was made by The Federal Glass Co. in the 1930's. We have 1 tumbler available for $15.00. 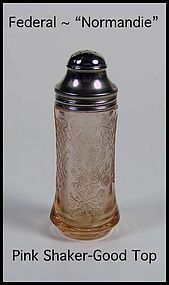 This pink Normandie "Bouquet and Lattice" SALT shaker is in excellent condition. It was made by the Federal Glass Co. in the 1930s. 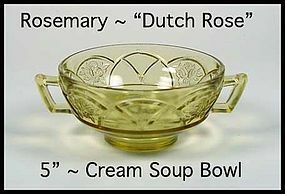 This amber Rosemary Dutch Rose cream soup bowl was made by The Federal Glass Co. in the 1930's. It is in excellent condition. 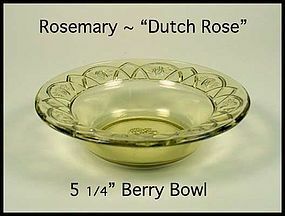 We have 6 bowls available @ $10.00 each. 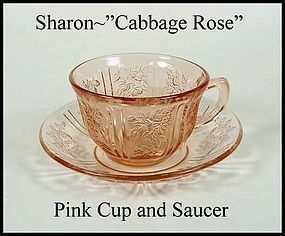 This pink Sharon Cabbage Rose cup and saucer is in excellent condition and was made by The Federal Glass Co. in the 1930's. 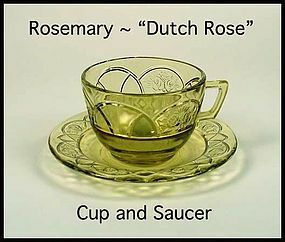 We have 3 cups and saucers available for $12.00 each. 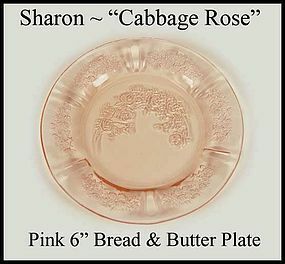 This pink 6 inch Sharon Cabbage Rose bread and butter plate was made by the Federal Glass Co. in the 1930's. It is in excellent condition!